Nomarks Anti Blemish Cream for Glowing Fairness. Nomarks Cream for Dry Skin comes in the Nomarks Dry Skin Products Kit along with other products including Bajaj Nomarks Soap, facial cleanser, a scrub and also a face pack. All the products have blue colored packaging signifying it's use for dry skin. Since this range is specially for dry skin with blemishes, I gave this to my mother for her dry skin with slight pigmentation and scars.Though there is no such heavy pigmentation but few dots here and there. Till now none of the de pigmentation cream have been able to disappear or fade the marks completely & permanently, so this time I thought let's try this so much raved Nomarks Cream with the tag line of No 1 Anti Marks Cream. Check the details and the review below to find my mother's experience with this dry skin anti marks cream. Nomarks Cream for Oily Skin, Dry Skin and All Skin types. With age, skin tends to become dry because of the loss of natural hydration, and becomes prone to blemishes & wrinkles. 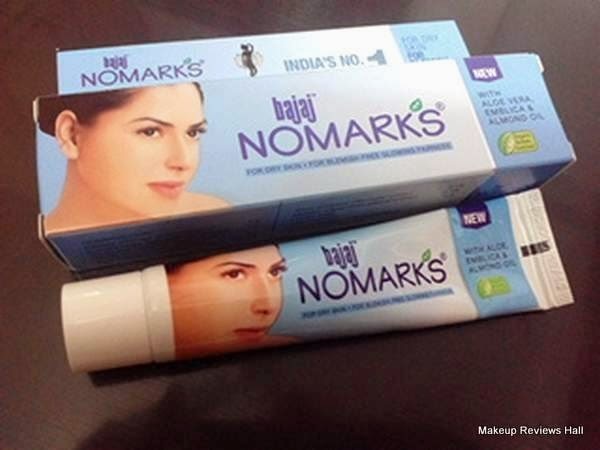 New Bajaj Nomarks Cream for Dry Skin and Blemish-Free Glowing Fairness is enriched with Organic Actives Enriched Ingredients like Aloe Vera, Almond Oil and Emblica that penetrate the deeper layers of your skin to prevent blemishes. USAGE : Use regularly. Starts showing visible effects in 4 weeks. For best results, apply cream 2-3 times a day on a clean face. Use Nomarks Face Wash for an efficient cleansing action. 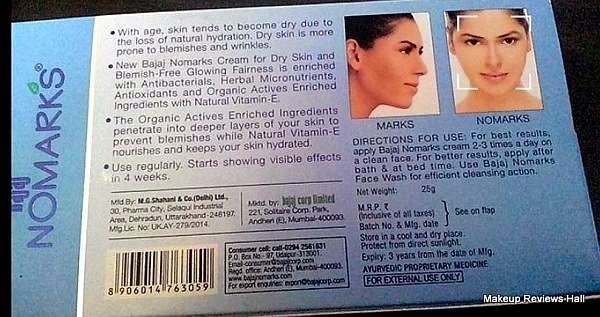 This Bajaj Anti Blemish Skin Cream comes in a blue colored packaging with a blue tube inside. The tube is lightweight and simple like most of the medicated creams. 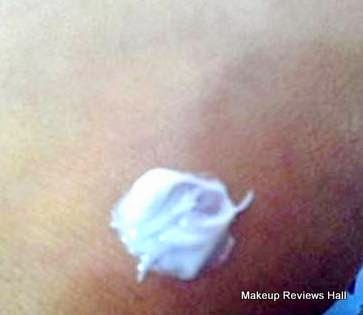 The cream pops out on squeezing the tube and appears to be little heavy as supposed to be for dry skin. On application, the cream gets nicely rubbed and absorbed on the skin because of its little greasy texture. However it does leave a shine on your face which I don't like much since that makes facial skin look little heavy. But I think it's quite natural since it's specifically for dry skin. One can go for Nomarks Cream for Oily Skin if you want matt effect. This cream gave quite satisfactory results on my mother's skin. She have been using this complete set of skincare, specially the face wash and cream without a miss and her marks, scars and pigments have reduced quite nicely in this much time. If not reduced, the marks have at least faded down with the noticeable difference. I would like to mention here that along with this Dry Skin Care Kit, she was also using organic pure coconut oil, for an extra layer of moisturization in winters. So I think this coconut oil might have been an added advantage. But other than that there were no other changes in diet or product usage. I don't know how well this would go in long term because normally whenever my mother uses skin lightening cream or anti blemish facial products she feels temporary difference in her skin tone but the marks return back overtime. Till now there has been no such problem with this Cream. So overall this Nomarks Cream really works on blemishes and pigmentation without harming the skin in any way. Though my mother's skin don't react to products easily rather adapt itself nicely unlike mine which is very sensitive and react with the use of even the gentle products. So I can't say about the effect of this cream on sensitive skin but since this is nice creamy, I don't think this would be a problem. You can surely try this once since it's very affordable. Moisturizes dry skin being thick & creamy. Fading of scars & marks over time with regular usage. Improves skin texture and quality with clear skin. Leaves skin little heavy with shine. Not sure if the results are permanent & would not get the scars back like most of anti marks cream. Labels: Anti Marks Cream, BAJAJ NOMARKS, Nomarks Cream, Nomarks Dry Skin Cream Review, Pigmentation Cream.